Our Fitzroy Island Resort Stay 4 Pay 3 special is available in Resort Rooms and Ocean Suites including Top Floor Ocean Suites. Book here or call us to secure your stay. Fitzroy Island Resort is nestled on the fringing Great Barrier Reef of Tropical North Queensland just 45 minutes from Cairns by ferry. Fitzroy Island is literally where the rainforest meets the reef. This resort offers excellent contemporary Hotel Studios and One & Two Bedroom Suites & Apartments. 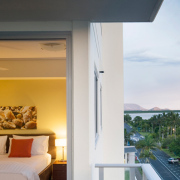 Cairns is a top family friendly destination, and there are no shortage of family friendly places to stay. Holiday apartments are ideally suited to families as they are well equipped with a kitchen, lounge and dining area - much like a home away from home. With our year round tropical climate you will find that all resorts and holiday apartments have at least one pool, if not a few, and onsite bbq facilities that provide a perfect way to entertain the family whilst on holidays. You can find many family discounts on activities and attractions around the region, plus stay/pay deals on long stay accommodation. Ask one of our friendly consultants who will happily recommend the best accommodation and tours to suit your families needs and budget. Holiday apartments are ideally suited to families. They come fully equipped with all you need for a long or short stay. Standard features include cooking facilities and all modern conveniences such as television, DVD, and internet access. Luxury apartments additionally may include features such as a European-style gourmet kitchen with all modern appliances, generous wardrobe space, full-sized washing machine and dryer, ensuite bathroom with oversized bath. The benefits of booking a holiday apartment include more space and privacy, plus the savings associated with dining in rather than dining out. The extra space is also a welcome feature. Dual key apartments have become increasingly popular with modern holiday accommodation developments in the Far North. They comprise of a hotel room/studio room and a one bedroom apartment that can be adjoined. A single front door opens into a foyer area, where you will find two seperate entries to the rooms. When the single front door is closed, the hotel/studio room and one bedroom doors can be fixed open to form a two bedroom apartment that you can walk freely between. The apartment side has full kitchen facilities and lounge area, whereas the hotel room has all your standard hotel features. The bonus of having two bathrooms makes it very appealing for families. Our favourite family friendly accommodation includes The Cairns Queenslander, located at the northern end of the Cairns Esplanade. This is an ideal budget option with the rooms having recently undergone a multi million dollar upgrade. Accommodation ranges from one to six people; families can take advantage of the kids 12 years and under staying for for Free! 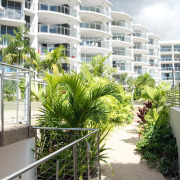 Located right on the Cairns Esplanade directly opposite Muddys Playground is Waters Edge. These luxury, spacious apartments are just a short walk to the marina, lagoon pool and restaurants. They feature two swimming pools plus bbq facilities. 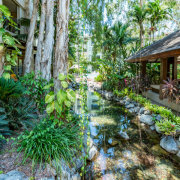 Paradise Palms Resort is located in Palm Cove on the Paradise Palms Golf Course & Country Club. This resort is perfect for family getaways offering resort guests complimentary entry into the Adventure Playground, which has all sorts of exciting activities including a giant jumping pillow, climbing spider, cubby houses, games room and an 18 hole mini golf course. 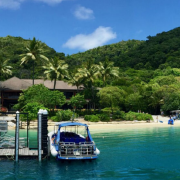 Fitzroy Island & Green Island make fantastic island excursions with many included activities such as snorkelling or glass bottom boat rides. The islands are fun to explore and perfectly safe for a first time reef experience. 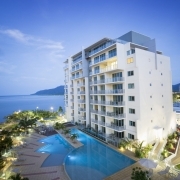 Cairns Queenslander - Kids under 12 years stay for Free! Package deals are a real winner for families, they offer fantastic savings, and with the most suitable touring and accommodation options pre-selected, it makes your holiday planning easy and hassle free as we take care of all the details for you. Our top family package deals include the 4 Night Queenslander Getaway Package - perfect for families on a budget including trips to Green Island and Kuranda, that are suitable for children of all ages including babies and infants. 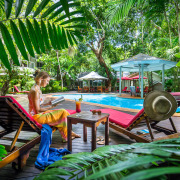 The Paradise Palms Tropical Escape package includes exciting reef and rainforest adventures, followed by free days to relax and enjoy the beautiful pools, adventure playground and mini golf at the family friendly Paradise Palms Resort. 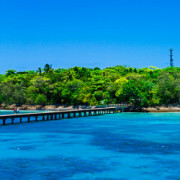 The 7 night Cairns Family Getaway is designed for families who would like to see the best of North Queensland, and the 7 Night Fun & Sunshine Package is the best value package deal by far, including 7 nights at the Mercure Harbourside in a Two Bedroom Suite, an Ocean Spirit Michaelmas Cay Cruise and the Kuranda Train & Skyrail Experience, with over $2000 of savings! It is best to book these deals in advance, especially during peak school holiday times. Excellent value package deals here! Kids will love holidaying in Cairns, there's so much to see and do! With a year round warm, tropical climate you will find an endless amount of outdoor activities where the kids can get active, explore nature and enjoy the great outdoors. Visiting Cairns can be very affordable for families too, with a host of natural attractions and low cost activities to keep you busy. Beat the heat at Cairns' coolest waterpark! Sugarworld Waterpark is a much-loved attraction for Cairns locals & tourists alike. Open every weekend during Queensland school holidays and public holidays, this affordable pool and waterslide complex makes for a fun family day out, especially during the hot summer months. Suitable for all ages; you're never too old to join in and beat the kids on the Mat Racer Slide, Tandem Tube Raft Slide or the Supajet Open Body Slide. For the little people, a Kids Interactive Place Space offers all the adventure with tipping buckets, water cannons and mini slides. Sugarworld is located at Hambledon Drive in Edmonton. Check the local Sunbus service for departures or self drive. Situated on the Cairns Esplanade overlooking the foreshore, Muddy's is a fabulous free playground and waterpark. It incorporates an interactive and educational experience with facilities designed for various age groups in each area of the park. The water features include jumping water jets, rain shelters and water gates. Other play areas include a flying fox, sound chimes, rope bridge, play houses, puzzle games and the giant colourful "Muddy" the Mudskipper sculpture. Special facilities are provided for children in wheelchairs, and there are plenty of shady trees. Nearby are BBQ and picnic facilities, plus the "Skippers" Cafe serving light meals and refreshments throughout the day. The Cairns Esplanade Skate Park is a popular recreational venue for both locals and visitors; whether you're a boarder, skater, rider or spectator, the size and innovative features of the park will certainly impress. During the day you'll find skate enthusiasts of all ages having a go; whereas the evening attracts the more experienced youth showing off their impressive tricks and manouvres. Just nearby is the bouldering park suited to all levels of fitness and climbing experience, no need for harness or ropes, just climb on and have a go. 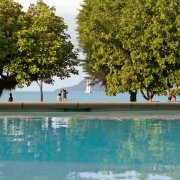 The Esplanade Lagoon has become one of Cairns’ best known and most photographed landmarks, featuring stunning crystal clear waters that sit against a backdrop of the Cairns foreshore, Trinity Inlet and rainforest covered mountains. This 4800 sq metre saltwater swimming lagoon is a popular haunt for both locals and tourists, providing a safe year round swimming location. The kids can enjoy building sand castles and playing in the shallow shady areas; the BBQ's and landscaped gardens provide a comfortable space to enjoy a picnic lunch, and every Saturday between 8:00am until 4:00pm the Cairns Esplanade Markets come alive with a mix of local, quality stalls selling jewellery, pottery, skincare, airbrush tattoos and more. The Cairns Recreation Centre plays host to a number of indoor sports and leisure activities, including roller skating on one of the largest indoor roller skating rinks in Australia, and rock climbing on the indoor rockclimbing wall. Night time Roller Discos are for the young and the young at heart with the "please bring back the eighties" theme; Retro skate is also becoming very popular on Saturday nights with entire families dressing up in Afro's, Mullets and leg warmers. Open to the publc through the week and on weekends, it's a great activity for the whole family to join in. Recently refurbished, the Cairns Go Bowling Centre is fun for all the family with all new glow lanes, laser lights and party music. Open 7 days a week, the complex features 20 Bumper Lanes, fully automatic scoring, a cafe & bar and amusement machines. Choose from 1 to 3 games, which all include shoe rental; family deals are available all the time. Located at 93 Pease Street, this is a great activity for those wet and rainy days! Casual visits welcome. Come and learn waterskiing, wakeboarding or kneeboarding at Cable Ski Cairns. One of only four cable ski parks in Australia, cable wakeboarding is a popular sport - anyone can do it. Located next door to the Skyrail Rainforest Cablelway and Tjapukai Aboriginal Park, Cable Ski Cairns is easily accessible and suitable from 11 years old. The park features a fully licensed cafe, BBQ area, beach area with sun lounges, Pro shop and car parking. Open 10am to 6pm daily. The Cairns Botanic Gardens is situated just 4km from the centre of Cairns and open every day of the year. The gardens are a pleasure to stroll around with many pathways to explore, bridges to cross and weird and wonderful plants to admire. You can learn about the many food and medicinal plants utilised by Aboriginal people of the Cairns area on the Aboriginal Plant Use Walk. Check out some cool ferns including the Titan Arum (Amorphophallus titanum) or corpse plant, named so because of the rotting meat smell that it emits when flowering. We also now proudly have the Cairns Botanic Gardens Visitor Centre and Cairns Botanic Gardens Precinct, which includes the gardens, nearby Centenary Lakes, rainforest boardwalks, childrens playground, Gondwanan evolution garden and Tanks Arts Centre. The Tanks Market Day takes place the last Sunday of the month from April - November and is fantastic for families featuring live entertainment, kids workshops, and a number of stalls showcasing a blend of local arts, craft, produce, vintage clothing, collectables and natural health products. Crystal Cascades is a popular natural swimming hole, located just a 10 minute drive from Cairns City. A series of small freshwater waterfalls hidden away in the rainforest make up the Cascades which run over smooth natural rock waterslides into deep swimming holes. The crisp clean water makes for a safe and refreshing swim, especially in summer when it is unsafe to swim at the beaches due to stingers. Ideal for families, the walk into the Cascades is short and suitable for prams and small children. There are picnic and toilet facilities, so make it a day and bring your lunch. Reef Teach is a very entertaining evening, featuring a nightly presentation that shares a special insight into the magical world of the coral reef. Be wowed by amazing facts and beautiful images, and handle a range of corals and other marine specimens – including some of the more dangerous creatures you wouldn’t want to touch in the wild! It will amaze, inspire, and have you laughing about the funny facts and weird and wonderful ways in which the reef works! By the end of the evening you’ll be able to identify many common fish and corals, be amazed at the extraordinary creatures (and the stuff they get up to!) out on the reef, and be incredibly excited about your upcoming Great Barrier Reef adventure. When you get out to the reef you’ll be thrilled at your ability to recognize a lot of what you see. The Reef Teach evening presentation takes place Tuesday - Saturday evenings, 6:30pm - 8:30pm, 2nd Floor Mainstreet Arcade, 85 Lake Street. Families welcome. We have enough family friendly tours to fill up your holiday itinerary and keep you returning for plenty more. 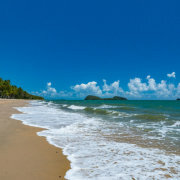 There is something for everyone that will certainly keep all members of the family amused, from the tiniest tot to the grandest grandparent all family members can be assured of a great tropical Far North Queensland experience. Many tour operators offer family package rates which offer savings based on 2 adults & 2 children. Children are usually classed between the ages of 4-14 years, however please check with the individual tour operators for their terms and restrictions. The Skyrail Cableway offers an exciting and explorative experience for kids, as you journey just metres above the rainforest canopy. An interpretation centre located at Barron Falls Station will keep the kids busy with interactive presentations of the rainforest environment. Touch-screen computers, videos and pictorials will help to unravel some of the mysteries of this complex ecosystem, while providing a fun and entertaining learning experience. A complimentary guided boardwalk tour with one of Skyrail’s qualified Rangers will identify some of the rainforest’s more unusual native plants species in a fun and informative way. You'll never grow out of the excitement of a train ride, especially when it's one of the most unique rail experiences in Australia. The Kuranda Scenic Rail authentic timber carriages will transport you between Cairns and the pretty village of Kuranda, via hand-hewn tunnels, across towering bridges, and through the awe-inspiring Barron Gorge. Freshwater Station provides the perfect start to this family filled day, modelled on the architectural style which was popular in the turn of the last centurary. The station features a Museum, Theatrette and Restaurant. Retired 85 year old railway carriages provide a unique dining experience, and with a hearty breakfast it's a great way to start your day. Green Island is an easy escape for the whole family. Situated just 45 minutes by fast ferry, the day is yours at leisure to do as much or as little as you please. Frequent ferry departures make it easy for families so you can shorten your day if you prefer. Glass bottom boat tours are a great introduction to the Great Barrier Reef, other activities include snorkelling straight off the beach, rainforest walks, paddling in a kayak or saying 'hello' to the crocodiles in Marine Melanesia. Parents facilities are provided on the island to make your day as easy and stress free as possible. Hartleys Crocodile Adventures is loved by many. Located just 40 minutes north of Cairns, Hartleys is the best place to see crocodiles and local wildlife in Tropical North Queensland. The entertaining and educational wildlife presentations including snakes, cassowaries, koalas, crocodiles and quolls really make it a fun day out, and the boat cruise provides the thrill and excitement of seeing crocodiles up close in their natural habitat. Curious to try a croc burgar? Now you can at Lilies Restaurant on the deck overlooking the lagoon. If there's anything more entertaining than viewing birdlife up close, its having breakfast with them too. You can do this at the Wildlife Habitat in Port Douglas. Enjoy a fantastic tropical breakfast buffet accompanied by the cacophony of sounds and colours of birdlife, as they mingle with the guests and roam freely in a natural setting. This award-winning wildlife immersion exhibit allows visitors to wander along elevated boardwalks, observing up close a huge range of flora and fauna. Hand feed a kangaroo, cuddle a koala and eyeball a saltwater crocodile. This wildlife attraction makes for a fun and entertaining half day out, where you can make friends with lots of cute animals. The Barron Family Rafting offers a fantastic introduction to white water rafting where the whole family can join in. Designed for children 6 - 12 years, this fun and exciting tour offers the thrills of paddling rapids graded 1 - 2. Dense rainforest surrounds Lake Placid, providing outstanding scenery along the way. Children 10 years old and above can test their rafting skills and raft without an adult, or take a two person Sports Raft with an adult and child in each. No experience is necessary for an afternoon of adventure. Reef Magic Cruises caters for all activity levels onboard their all-weather Marine World activity platform. The platform has something for everyone, from the non-swimmer or first time snorkeller, to the most experienced certified diver. In-water activities include unlimited snorkelling, introductory diving, helmet diving, certified diving and guided snorkel tours. Dry activities include semi-submersible tours, glass bottom boat tours, an underwater observatory, reef scenic heli flights, a marine biologist presentation and the regions only reef based massage service. This range of activities is sure to please every member of the family, and with 5 full hours at the reef, there is plenty of time to do it all. Discover and explore the wonders of the Great Barrier Reef with Sunlover Cruises. This family friendly outer reef trip visits Moore Reef pontoon where you can enjoy 4 hours of reef activities such as snorkelling, glass bottom boat and semi submersible coral viewing tours and an underwater observatory. For infants and toddlers there is a fully enclosed kids pool where they can swim in a safe, enclosed environment and still get to experience the Great Barrier Reef, as fish can swim inside the enclosure. The marine life touch tank is a great feature on the pontoon, allowing guests to hold and touch various sea creatures, and experience unique marine life up close. Fitzroy Island is a short 45 minute ferry ride from Cairns. Rugged and unspoilt, the majority of Fitzroy Island is National Park and the perfect place to enjoy some exploring and adventures. The national park comprises of mangroves, open woodland, tropical pristine rainforest and coral beaches, that are best explored by the walking trails around the island. Other activities include, snorkelling, swimming, sea kayaking, ocean trampoline, viewing the reef by glass bottom boat and simply relaxing to take it all in. Fitzroy Island Resort offers affordable luxury studios, self contained apartments and beach cabins, or for those who want to be closer to nature a camp ground with facilities is located nearby. Situated just five minutes travel from Kuranda; Rainforestation offers a rainforest, wildlife and cultural experience all wrapped into one. The kids will love the army duck ride, it's a unique way to view the rainforest with a knowledgeable Duck Captain who will point out interesting trees, birds and wildlife along the way. The koala & wildlife park is the place to handfeed the kangaroos and wallabies. Have your photo taken with a koala and meet the star attraction of the park - "Jack the Ripper" a 5 metre saltwater crocodile weighing 650kgs. The Pamagirri Dance Show and Dreamtime Experience gives a taster of some Aboriginal Culture, and before you leave make sure you grab a fresh tropical fruit icecream from the from the Tropical Treats Juice Bar, situated in the Tropical Fruit Orchard. Blazing Saddles Adventures is the longest established horse riding and quad bike tour company in Far North Queensland. Located just 10mins from Cairns and the Northern Beaches, this half day tour makes for an exciting soft adventure activity for the whole family. The horseriding trails are perfect for absolute beginner riders, minimum age 4 years. The ride takes place through bushland and rainforest surroundings, with interesting trails, and wildlife spotting along the way. The ATV (Quad Biking) is suitable from 12 years old. No experience is necessary as a skills & safety lesson will be conducted on the day. The ATV tour will have you zooming through the rainforest and adventure trails in no time! Float down the Mulgrave River on a professional high quality twin chamber tube. This safe fun water activity will take you through beautiful scenery as you drift through small fun rapids. Suitable for children from 5 years old, this 2 hour trip provides adventure for all the family. Morning tea is provided, however bring some extra snacks to enjoy while you drift. River Tubing departs mornings daily at 7:45am, and afternoons seasonally at 1:45pm.